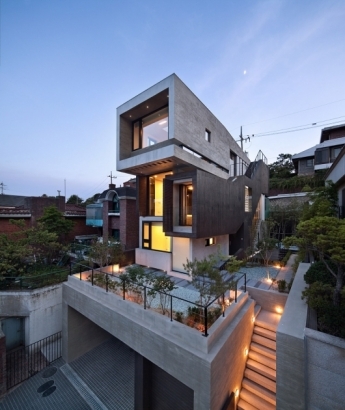 South Korean architect Sae Min Oh of Gangnam-based Bang by Min emerging design group has sent us photographs of H-House, his award-winning residential building in Seoul's Seongbuk-dong neighborhood. 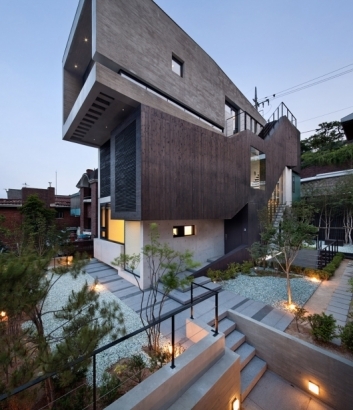 The project was awarded the 30th Seoul Architecture Prize as well as the Korea Interior Design Best Awards in 2012. The site of ‘H-House’ had the slope ground where the front level is lower about 8m than the back level, which became a problem in designing it. Besides this physical problem, the architect had more difficulties with the client’s demands; to create a house for three generations, a house with good daylighting and ventilation on the basement and the first floor. Consequently, it is a successful project because the client is satisfied with it. Firstly, the architect had to design a space where three generations could live together and privately at the same time, in order that they could behave individually while being together. The architect created the second floor as an interspace of this house divided into three floors, where they can form a community of family, behave individually and have their own area. He divided the living room on the second floor into three levels, which give each member of family their own area naturally. This space opened but different in levels enables family to do privately and separately. And folding door and changeable wall make it possible to expand or divide the space according to the user’s demand.